This exhibition features new photographic works by acclaimed Vancouver artist Stan Douglas. Through synthetic and artificially constructed processes Douglas manipulates new camera devices to produce pictures without a lens. Responding to the wide circulation of immaterial images in digital culture the artist reveals an acute awareness of the social impact of media and optical technologies. Corrupt Files are a series of digital photographs that have been extracted from Douglas’ previous photographic works. Here, abstractions emerge through the process of compressing representational images for reproduction. 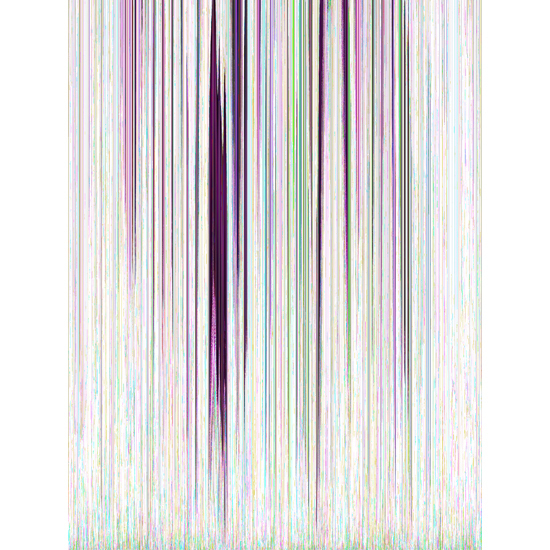 The saturated colours and tonal range of the original file errors are translated into linear patterns as if garbled by an apparatus. While reduced to patterns of electronic data, the photographs are direct, unaltered reproductions of the data itself. Unrecognizable and abstracted, the images nonetheless remain concrete visual records. These synthetic images capture a sense of a ‘ghost in the machine’ interfering with the digital file. This material rendering of the virtual, foregrounds questions of documentary realism that persist in contemporary photography. The black and white photographs relate to Douglas’ film and video installations, particularly his ongoing examination of modernist legacies and socio-historical narratives. Frequently borrowing from popular culture and literary sources, he re-inscribes the pictorial conventions and genres of photography. 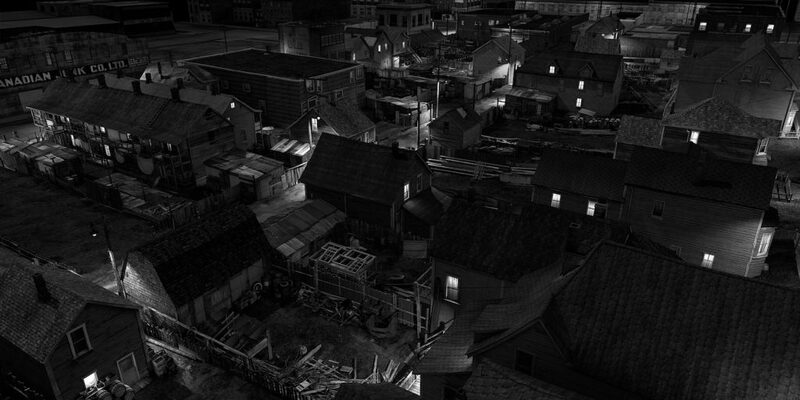 Hogan’s Alley is a panoramic, bird’s-eye nightime view of postwar Strathcona that seems to glow as if projected on a screen. Distilled from the artist’s online iOS app Circa 1948—which constructs an immersive experience of Hogan’s Alley and the Hotel Vancouver—the digitally reconstructed scene blurs distinctions between artifice and realism. Digitally rendered with intricate historical accuracy, the image creates a hyper-real intensity through excessive detail, beyond what a camera lens can capture. The image is thus detached from its temporal grounding in a way that gives the past a place in the present, a common effect in Douglas’ artworks. 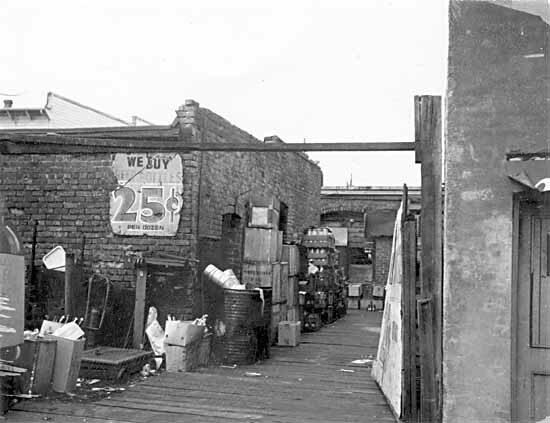 Research for the 3-D computer modeling of the mise en scene was based on an archive of photographs that surveyed this mixed race neighbourhood after it was slated for demolition in 1972 as part of the urban “renewal” that included construction of the Georgia Viaduct. Arranged by streets, every building is methodically recorded from different angles with blanks indicating empty lots. 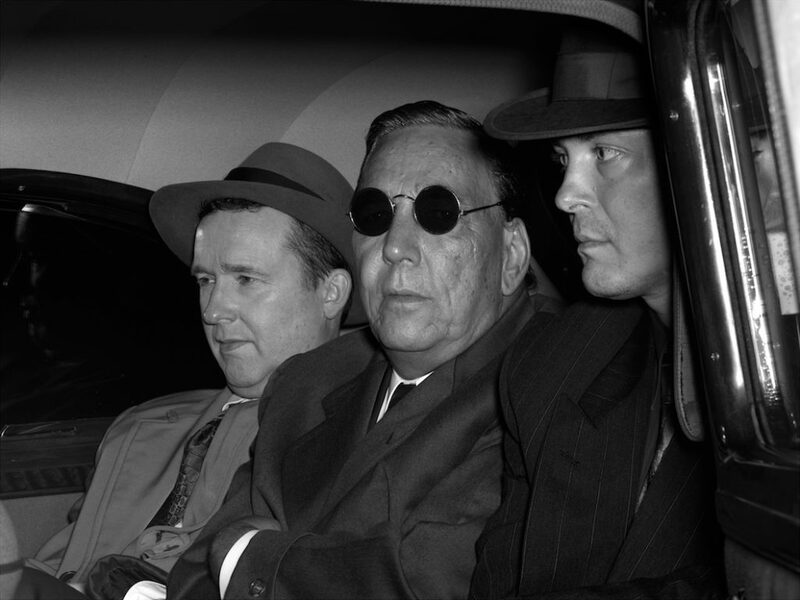 Based on historical research for Douglas’ cinematic stage production Helen Lawrence, a multimedia film noir thriller, his new works allude to social tensions that still exist today. The exhibition includes prints from his Midcentury Studio series that similarly refer to a fraught historical period. 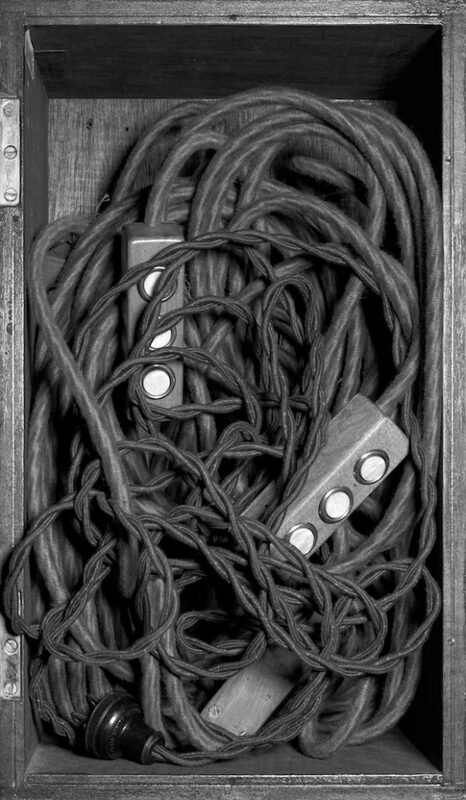 The black and white prints, simulated in a photo-journalistic style of period photography, are staged reenactments of a formal studio setup and news photographs of a crime scene, a scandal and a cache from an unspecified mystery. These works set into play slippages between documentary and directorial modes. Another pointed reference to the histories of photography, Machine documents a “judging box” apparatus that was built for judging photographs at the First International Vancouver Salon of Pictorial Photography held at the Vancouver Art Gallery in 1940. While evocative of a recently past analogue era, the Midcentury Studio synthetic pictures sit squarely in the digital present. Stan Douglas was born in 1960 in Vancouver, where he continues to live and work. He graduated from Emily Carr College of Art in the early 1980s. His international solo exhibitions include: the Serpentine Gallery, London (2002); the Studio Museum in Harlem, New York (2005); and the Staatsgalerie and Württembergischer Kunstverein in Stuttgart (2007). He has participated in important group exhibitions worldwide including Documenta IX, 1992; X, 1997; and XI, 2002 as well as the Venice Biennale in 1990, 2001 and 2005. Douglas’ work is in the museum collections of Centre Georges Pompidou, Paris; MoMA, New York; National Gallery of Canada, Ottawa; Solomon R. Guggenheim Museum, New York; and Tate Modern, London. His accomplishments have been recognized through numerous awards: the Bell Canada Video Award (2008), the Infinity Award from the International Center of Photography, New York (2012) and the Scotiabank Photography Award (2013), among others. He is represented by David Zwirner Gallery, New York/London and Victoria Miro, London. Douglas teaches at the Art Center College of Design in Pasadena, California. Two new books on Stan Douglas, published by Prestel and Steidl, will be launched in the coming months, and the world premiere of Helen Lawrence is currently at the Stanley Theatre, Vancouver. The artworks are courtesy the artist, David Zwirner, New York/London and Victoria Miro, London. The historical prints are courtesy the City of Vancouver Archives. Research for this exhibition, as well as Helen Lawrence and Circa 1948, was supported through financial assistance from Arts Partnersin Creative Development. Sunday, May 25, 3:oopm | A conversation with Stan Douglas and Helga Pakasaar followed by the launch of Douglas' new 2013 Scotiabank Photography Award monograph published by Steidl. Watch Stan Douglas in conversation with Helga Pakasaar from May 25, 2014. Listen to Stan Douglas in conversation with Eleanor Wachtel from CBC Radio's Ideas. You can find the new NFB/Stan Douglas collaborative app Circa 1946 here.